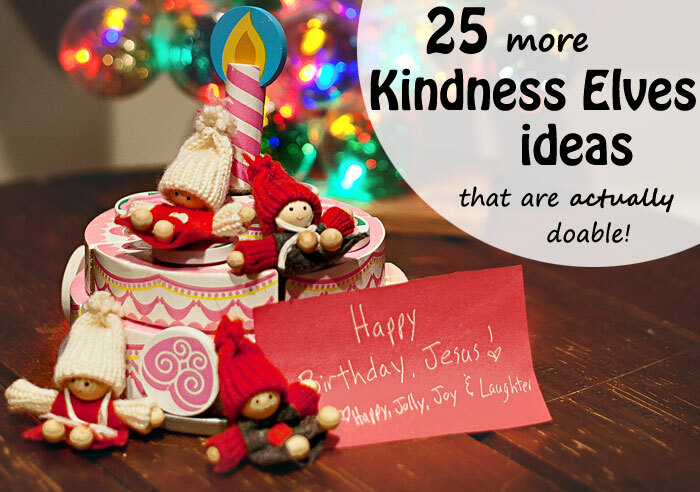 25 ideas to help your Elves encourage kindness this Christmas! 1. Bake sugar cookies and give some to a neighbor. This is probably the most involved activity and I’m only including it because it’s a tradition around here so we have to do it at some point in December anyway. 2. Make coffee for your Mom! This is my favorite! Last year our elves ended up using this one a few times!!! 4. Pray for your friends. Some of our friends just started a church in NYC, we pray for them often but this day we’ll take some specific time to pray for them, as well as anyone my girls want to pray for. 5. Order pizza for a college kid (or other friend). If you know someone in college, find out when they’re having exams and send them a pizza the night before, so they can eat while studying. 7. Make a homemade gift for someone. Nothing elaborate (unless you want to). My oldest two love sewing pillows and giving them to each other. we already have the felt and stuffing they use, and they can do this almost completely by themselves, so it’s super simple. 8. Send a gift to a friend. Not someone you would usually plan on exchanging gifts with for Christmas. Maybe someone who doesn’t live nearby (if you have Amazon Prime, there are lots of stuffed animals and other small gifts in the $5 range that you can ship free to someone and select the gift option to have it include a gift receipt and a personal note). 11. Feed the birds. For us, we have a birdfeeder but it’s currently empty, so my girls can just fill it up again, easy peasy. Alternatively we could walk down to the little pond in our neighborhood and throw some stale bread pieces to the ducks, or make a simple bird feeder. 12. Hand down some books. Our neighborhood has a little free library, so I can drive up in my jammies and let my girls run over and put in a few books! 13. Put some pennies on the sidewalk for someone to find. Who doesn’t smile when they find a penny? 14. Make a “boo-boo” pack. Fill a sock that no longer has a match with rice, use a hair band wrapped as tightly as you can make it to close off the end, then put it in the freezer. Next time someone gets hurt, get them the cold pack to help them feel better. 15. We set out breakfast for you just to be kind (no strings attached). -I’m thinking some of those personal boxes of cereal because we never have those. 16. Send a gift to a charity. I noticed when I opened Amazon that they have a page for people to send gifts to a charity called GameChanger that brings cheer to kids in the hospital by providing books and games and such. Just go to their list and select an item to send. There are books as cheap as $4. A quick and easy way to put a smile on someone’s face. 18. Kids prepare dinner to give your parents a break. OK, so my kids aren’t actually able to cook completely on their own yet, but I can have stuff for a “snacky” dinner available – cheese cubes, crackers, summer sausage, hummus, baby carrots, grape tomatoes, pre-cut apple slices, etc. and my kids can get it all out, set the table, etc. so it’s still a win. 19. Tell someone something you like about them. 20. Grab a drink (or dinner, or whatever) from Sonic and give the carhop a $5 tip. 21. Gather a few friends and go caroling at a nursing home. I promise they won’t care how well you sing. Print out a few Christmas carols if you don’t know all the words and go sing. This is a bigger endeavor than most on this list but it’s one of my favorite things to do at Christmas, it spreads so much cheer, and makes great memories for the kids, too. 23. Anonymously leave a bag with paper plates and plastic cups at a friend or neighbor’s front door. Leave a note wishing them a Merry Christmas with fewer dishes. 24. Hand out coloring books at the Christmas Eve Service. If your Christmas eve service, like ours, doesn’t have childcare – take a handful of inexpensive coloring books and crayons and give them to families with little kids (keeping some for your own kids…and asking the parents first, of course). I plan to order this set of 36 for $10, keep a few for each of my girls, and hand out the rest, along with a colored pencil. So there you have it. Now as far as wow awesome I will be at actually doing these…well last year I forgot at night and had to scramble in the morning by like day three, so…yeah. I’m definitely keeping this list of reasons your elf forgot to move handy, because I’m sure I’ll need it! But at least I feel like I’ll have a better chance of remembering if I have a plan to use. What are your favorite, simple acts of kindness? I’d love to have some spare ideas in case it doesn’t actually work for me to do some of the bigger items on this list.